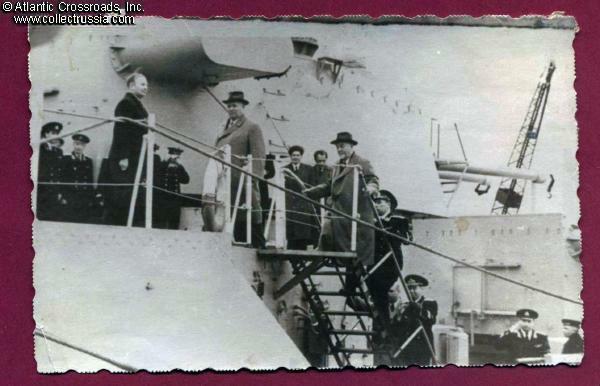 Rare original grouping of 14 photographs documenting Nikita Khrushchev's 1956 visit to Britain to attend the international naval procession at Spithead and conduct diplomatic meetings with the UK government. 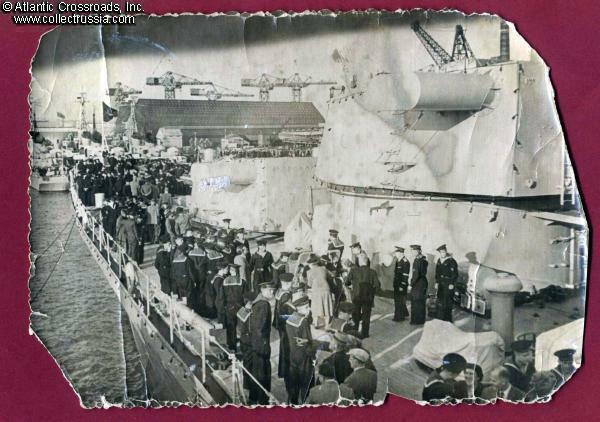 Rare original grouping of 14 photographs documenting Nikita Khrushchev's 1956 visit to Britain to attend the international naval procession at Spithead and conduct diplomatic meetings with the UK government. Since he was accompanied by Premier Nikolai Bulganin, the British press hailed the Soviet visit as the "B and K Tour" or, more frequently, the "B and K Show"! 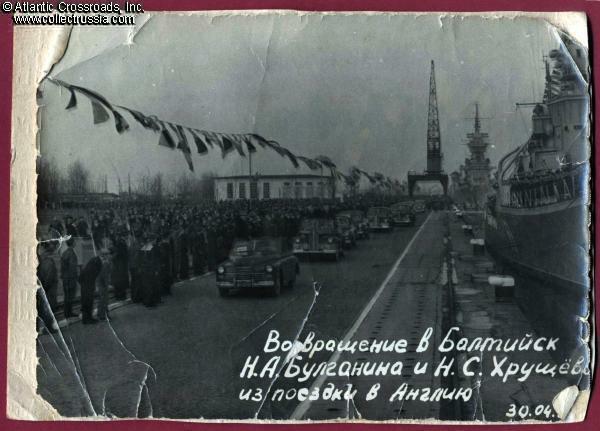 The photographs can be divided into two categories: pictures showing Khrushchev and/or the official party and photographs showing Soviet naval vessels: the cruiser Ordzhonikidze, which was the flagship of the 3-vessel Soviet "squadron", and the smaller destroyers Sovershenny and Smotryaschii. The pictures of the official party may have been taken either before, during, or after the voyage. 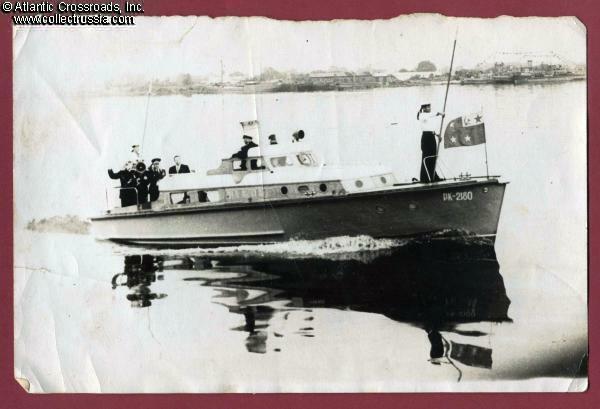 One picture definitely seems to show British civilians inspecting one of the Soviet warships. Khrushchev wanted to make grand entrance in England aboard a TU-104 jet airliner (there were less than six jet airliners in the entire world in 1956), but the Soviet aviation authorities were worried about safety issues and refused to let him do it. The alternate choice was to sail to England on board the three ship "flotilla" heading to the April naval procession at Spithead. Photograph 1. 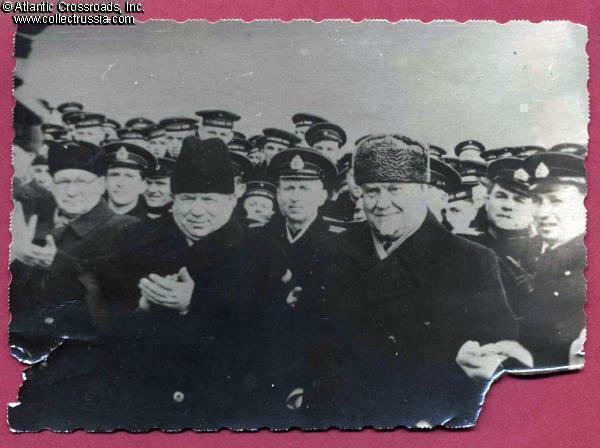 Khrushchev and Bulganin with Soviet Naval Officers, 4 1/2" x 3 1/4", lower right and left hand corners damaged, probably from having been mounted in an album. The men's choice of particularly "Russian" headgear probably indicates that they are in the USSR, either just beginning their trip or just returning. Photograph 3. 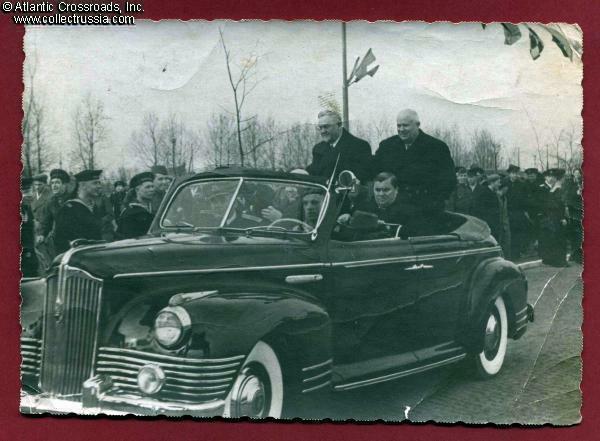 Khrushchev and Bulganin in an open touring car, probably in the port of Baltiysk 4" x 5 3/4". 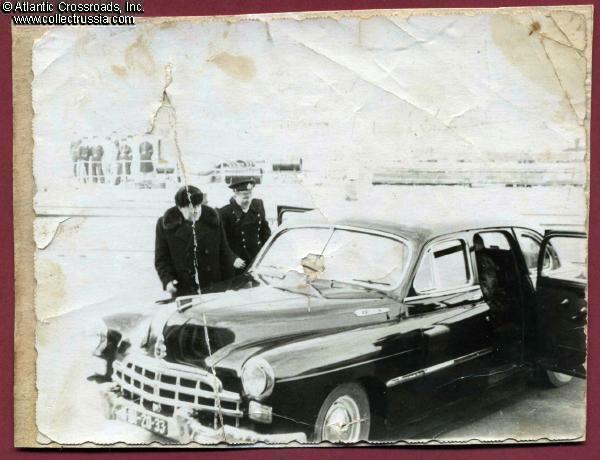 This is the only photograph in the grouping with anywriting on the reverse; the inscription says "N. S. Khrushchev". Matte finish. The two men are perched on top of the car's back seat and, in spite of the obviously cold weather, have removed their hats. Photograph 4. 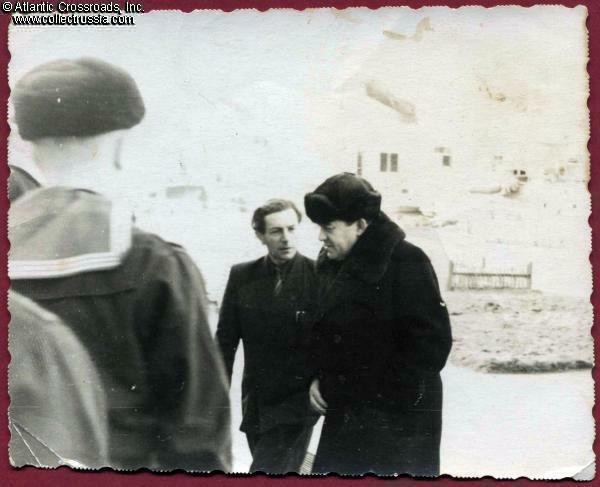 Khrushchev and Bulganin's official party leaving the dock area in Baltiysk 5" x 6 3/4", photo pasted on to textured light cardboard, possibly once a part of an album? 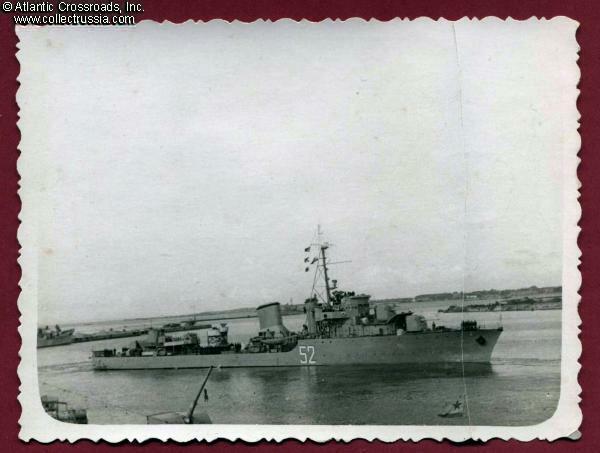 Large, handwritten inscription in white indicating that the photo shows the two returning to Baltiysk from their trip to England. Please note: the inscription (with a 30.04.56 date) was written on to the negative and not separately on the surface of this photo. Interestingly, under magnification, it can be see that the passengers in the cars have been retouched out! Baltiysk was a closed city near Kaliningrad and home to the Soviet Baltic Fleet. Photograph 5. Naval personnel and Soviet civilians somewhere in the course of the trip. 5 1/2" x 4 1/4". Without any fanfare, Khrushchev is known to have brought at least two eminent Soviet men of science with him on the trip: Igor Kurchatov, the nuclear physicist, and Andrei Tupolev, the aircraft designer. 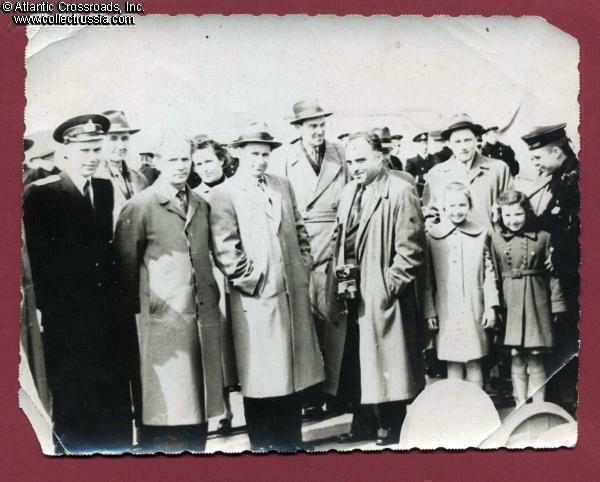 It is worth noting that the man with the camera around his neck is possibly Sergei Korolyov, the father of the Soviet space program - could Khrushchev have also included him on the trip to England? 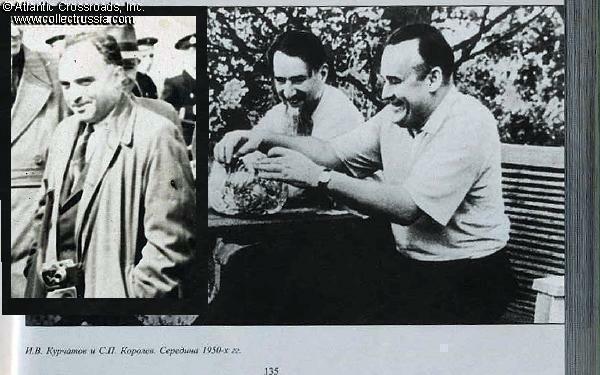 We include an enlargement of a photo that we have copied from a book that shows Kurchatov and Korolyov together; we have superimposed on the left the person we believe to be Korolyov in this grouping. Korolyov had a very distinct appearance (and hairline) and we really feel that he is the "man with the camera". Please note that the photograph of these two scientists is not a part of this grouping. Photograph 6. Civilians inspecting a warship under the watchful gaze of Soviet Sailors. 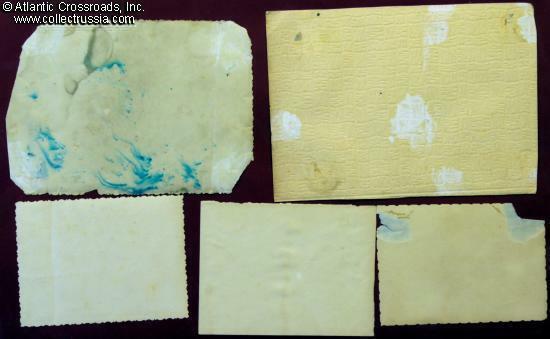 6 1/4" x 5 1/2"; tattered edges and staining on the reverse. While members of the Baltic Fleet were playing gracious hosts to the British public above deck, other sailors were apparently diligently guarding their ship below the waterline: during the visit, a dead British scuba diver was found floating near the Soviet ships. It has been assumed ever since that he may have been a MI-6 operative trying to investigate the undersides of the Soviet vessels (shades of James Bond!). Photograph 7. Soviet support ship flying the flag of the Fleet Commander in command of the three ships that sailed to England. 7" x 4 ½", never mounted in an album. Probably in the act of transporting Khrushchev and Bulganin to the cruiser Ordzhonikidze as the party is about to set sail for the UK (or transporting them from the cruiser to the Soviet port facilities on their return). Photographs 8 and 9. Unknown Governmental official or Party Leader attached to the official party 4 ¼" x 3 ½" and 4 5/8" x 3 1/2'" Photograph with a car is pasted on to textured light cardboard and is in very poor condition; the photograph with sailor on the left side is in very good condition. A well dressed mystery individual, unknown to us but someone of sufficient importance that the photographer took and kept two pictures of him. Photographs 10 through 14. 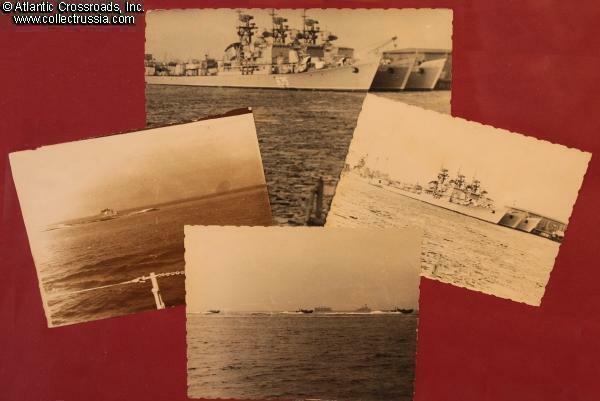 Views of various Soviet warships, probably at the international naval procession at Spithead> Most are about 3 1/8" x 4 3/8" in size although one is 4 1/8" x 5 3/4". None have ever been pasted into an album. One shows fast attack boats passing by while another shows a submarine. All of the other photos apparently show cruisers or destroyers. All of the "ship" pictures are in very good to excellent shape with the exception of the one that shows a ship clearly marked with the number "52": it has a vertical crack in its surface. The general condition of the photographs can be gauged from our reproductions of them. While some are in very good to excellent condition, others show wear - some of it considerable. The reverses range from eight or nine that were quite evidently never mounted in an album to five that do show the effects of having been pasted down. Still, virtually all of the images are clear and would display well in a photo album with archival pages. This is without a doubt an extraordinary one-of-a-kind documentary grouping with historic significance.